The other reason is that I don’t trust my surge protector, and I try to unplug my PC whenever we get a thunderstorm right over town. I could hear the lightning getting closer and closer so I tried to hurry. My dog kept me company by hiding under the desk, shaking. He really doesn’t like thunder. I’ve been reading a lot about concrete and cement sculpture, and the most valuable resource I found was the Maker’s Gallery, where I found Andrew Goss’ recipes for cement mortars. You can see those emergency shelters I mention in the video here, and the book I purchased to find out how it’s done is here. It’s an interesting read, but certainly not needed if you’re just making a sculpture. When I get around to making some how-to videos I’ll tell you how I mixed in the latext paint (believe me, I was happy to find a way to get rid of some of the extra paint in my basement without taking it to the local landfill). Andrew’s mortar recipes use stone dust. I used powdered marble, which you can get online in a 4 pound size for about $7. I searched around and found a 50 pound sack of finely ground calcium carbonate (same thing) that’s used for agriculture that also cost about $7, but I don’t think Azure Standard will deliver everywhere. If you have them ship UPS it will cost a fortune. Mine came on a truck on their regular delivery route. The stone dust is used in place of sand in Andrew’s unsanded mortars, and makes a really smooth mix. The Metakaolin comes in 25 or 50 pound bags, and I think there’s only two companies in the US that sell it. It’s a special form of clay (not the same as plain kaolin) and makes a really big difference in the mix. You don’t need much, so 40 pounds may be an excessive purchase for most people, but I do think there’s a vendor on etsy.com that will sell a smaller package for sculptors who really only need a little. Do a search on that site to find it. I bought both the metakaolin and the special fibers from Fishstone Concrete Counter Supply. They ship really fast, and the shipping charges were not excessive. Be sure to let me know if this is something you’d be interested in learning how to do – once I figure it out myself, of course. I’ll probably spend the rest of summer playing around with cement, but I could put my videos on another site, if you want to keep this blog strictly for paper mache. Your opinion is important to me, so be sure to leave a comment on this post. I’m so glad your sculpture survived the elements. I think it’s more about your skill than luck, but we won’t quibble. Is the little boy taking his dog for a walk your sculpture? It’s really nice – and it must get so many comments from your neighbors. I don’t suppose you kept photos of how you made him – if you did, would you be interested in writing a how-to guest post for us? I’d really like to try again, but perhaps do it right this time. I’ve never heard of adding the drywall joint compound to concrete. Now I’m really intrigued. If you just happen to take photos when you rebuild your cat, I know there are a whole lot of people who would really like to see how you do it, including your cement recipe if you’re willing to share. If you’d like to write a guest post for the blog, please let me know. I was most thrilled with your little boy and his dog because for years I’ve been thinking about making a little fairy girl peaking around one of my trees and shyly smiling at folks who walk by. But after watching my farmer boy fall apart, I’ve been afraid to try it. I know a few thousand other people who would also love to see how to do it. We have a guest post on the blog showing us how to make outdoor sculptures with Pal Tiya, and I know it’s a wonderful product, but it’s too expensive for most of us. But it sounds like we could actually afford the materials you’re using. Thanks Jonni I would love to do a guest post on your blog! I will take pictures and write up something about how I make my sculptures. Including the recipe that I use for the papercrete. The guy walking the dog through the tree has been out in the weather for over a year. Going by the photo dates I finished that one January of last year. Living in the Tampa Bay area he has been subjected to torrential downpours almost daily in the summer. Give me a couple of weeks to get something to you. Jonni, My name is Sharon Ballard Smith, I am an art teacher at Eagle School Intermediate in Martinsburg, West Virginia. I would like to do cement animals in a garden with my Art Club students and I would like to create cement sculptures of children for my school. 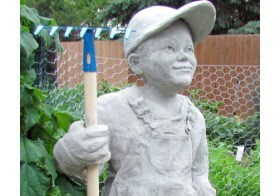 Please do a “How To Video” for the Farm Boy Cement Sculpture. This process would be just what the principal of my school is asking for the surrounding landscape of our school. I will also need a price list for him to see. I know that I will enjoy making these sculptures for my school and these sculptures will be my Legacy to the school. HI Sharon. I would love to help you, but I have to confess – my little farmer boy now has numerous cracks that had to be repaired with epoxy clay. It was the first large sculpture I ever made with cement, and the last. However, there are several good books on the subject. My favorite is by Sherri Warner Hunter. She goes into great detail about the supplies you’ll need, and she does include sculptures as well as pots and garden ornaments. I did not use her techniques to make my little farmer boy, and that’s why it didn’t last. You might also want to contact Wouterina DeRaad, who has a beautiful sculpture garden where she conducts workshops. She would be a great resource. I would love to see a video on sculpting the little farmer ! My poor little farmer is currently undergoing some repairs because I didn’t reinforce the cement the way I should have. One of these days I’ll try again, and try to do it right the next time! 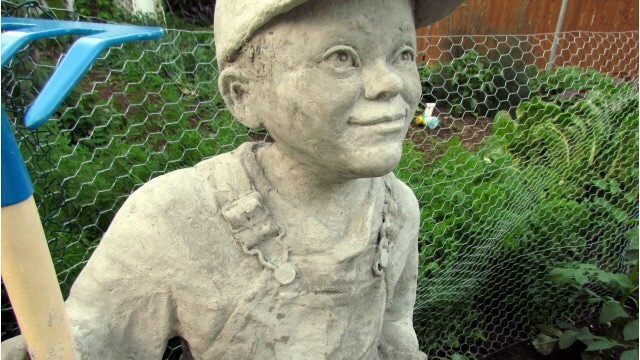 In the meantime, be sure to watch the videos on the Pal Tiya website – they aren’t using concrete, but you’ll love their work and you might get some great ideas for your own sculptures. Do you have a how to video yet on how to make these cement sculptures? I am extremely interested in what the easiest process is. Thank you for sharing all your talents with us. No, sorry. I read as much as could on the subject, but I never felt like I knew exactly what I was doing. In fact, this sculpture has cracked since it was made, because it wasn’t properly reinforced. I’ve decided to use epoxy clay for my outdoor sculptures, because it’s easier, and because I don’t have to lift 90# bags of cement. Love your little man. Can you share how you covered the clothes with cement? I have watched your video over an over. Looked at all the websites you suggested and am about to dive in and do more than one garden sculpture. I love your little foyarmer boy and want to do one similiar for my garden pulling a radio flyer wagon. Did you sculpt the boots or did you use real one dipped in cement? You have the best videos on you tube. I sculpted the boots, but it was easy, since they’re just basic shapes. I do regret that I didn’t reinforce the outside skin of the sculpture better, because I am getting some cracking, mostly behind the knees. If I did it again, I would pay more attention to that area. And thanks so much for your kind comments about my videos. That’s so nice of you.